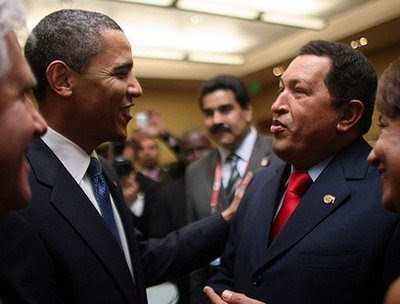 FOREIGN CONFIDENTIAL: Was Chavez Shipping Drugs to US via Honduras? Is the Crackpot of Caracas also the Cocaine King of Caracas? Foreign Minister Enrique Ortez dropped a bombshell last week when he said Zelaya, the president who was thrown out by a constitutional process June 28 after defying the law, had a little side business with the Caracas caudillo allowing cocaine to roll into Honduras from Venezuela before heading to the U.S.
"Every night, three or four Venezuelan-registered planes land without the permission of appropriate authorities and bring thousands of pounds . . . and packages of money that are the fruit of drug trafficking," Ortez told CNN En Espanol. "We have proof of all of this. Neighboring governments have it. The DEA has it." If Ortiz is right, the U.S. effort to restore Zelaya to power would be suicidal for U.S. efforts to destroy drug organizations south of our border. It would undercut Mexico's and Colombia's savage drug wars and give drug lords such as the Sinaloa cartel's Shorty Guzman, who has bases in Honduras, reason to strengthen operations. It also means the U.S. must start asking questions about Chavez's role in the drug trade now that U.S.-Venezuelan diplomatic ties are being restored. Right now, it's such a hot potato that nobody in either the State Department or the Drug Enforcement Administration wants to comment on it.